The past few weeks have been spent busy perfecting some Christmas recipes for cakes and cookies and other preparations for our Christmas parties. I had hardly any time left to spend experimenting new dishes for dinner. 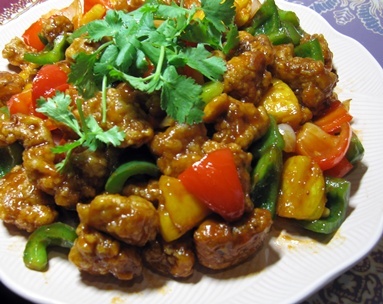 My father loves sweet and sour pork and sometime ago, I had promised to cook that for him. So I guess, this long weekend was as good a time as any to make good on that promise. The pork cubes were prepared and left to marinate for 5 hours. Each bite yielded tender meat and most importantly, no ‘porky’ smell. We found the dish a little too sweet for our liking and so I have reflected a reduced amount of sugar in the reproduced recipe below. Other than that, the family gave it a thumbs up and every single morsel was polished off. 1. Season pork cubes with light soy sauce and Hua Diao Jiu. Add in egg and combine well. Keep in the refrigerator and leave to marinate for at least 1 hour. 2. Add all sauce ingredients in a separate bowl. Stir to mix well and set aside. 3. When ready to cook, coat marinated pork cubes with cornflour. Make sure all sides of pork cubes are well covered with thick flour. 4. Heat wok with oil over high heat or use deep-fryer. Deep-fry pork for 5 min, or until crisp and golden brown. Remove from wok and drain on kitchen towel. 5. Clean wok. Heat wok with 1 teaspoon of oil, stir-fry chopped garlic till fragrant. Add bell peppers and pineapples, stir-fry for 3 min. 6. Return fried pork cubes to the wok and pour in sauce mixture. Stir-fry to combine well. Fry all ingredients briefly over high heat for 1 min and dish onto serving plate.